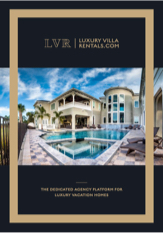 LuxuryVillaRentals.com offer thousands of the best vacation homes in the world's most exclusive destinations. Our homes range from 1 bedroom apartments to 15 bedroom private estates. Guests can expect spectacular accommodation, private pools, hot tubs, gyms, game rooms, movie theaters, bowling alleys and much more. Our experts have unique knowledge of each villa and the surrounding areas, giving you the best possible guidance and advice. We give you an advanced booking platform and all the tools you need to expand your market and increase villa sales. We can offer you a range of extra services which can be added to many of our villas, creating the ultimate experience for your guests. Thank you so much for making our family staycation truly a wonderful experience. The staff are fantastic and we were well spoiled. We made lots of memories here this weekend. A fabulous villa, fab pool outside is so enjoyable and we used it so much. Val is a total star, looking after us all, we will miss her. Your villa made our stay so memorable. Hope to come back soon. Loved the Spa and Pool. We spent most of our time in the lanai, so nice to have a tv out there too. Beautiful home and area, quiet and private. Thank you for finding us a home for our 30th Anniversary. We loved it. P.S. Best part was we could have our two girls with us (dogs) and they loved it too!! Best trip ever! !Amazing cleaning staff always kind and friendly, Barbados is amazing and breathtaking, 7 days was too short for us. This home was more than we could ever ask for. The view and pool we loved. Thank you for allowing us to enjoy our vacation here.